Paso 1: Install and open 4K Blu-ray to PS4 Converter on PC/Mac. Paso 2: Clic “Load Disc” to load 4K Blu-ray movie in the Blu-ray Converter. Paso 3: Choose PS4/PS3 supported video format from the Profile panel. Paso 4: You can select the highest resolution of the video file by clicking the Settings button to convert 4K Blu-ray video to PS4 in the best output file. 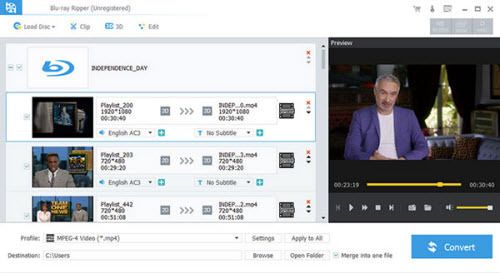 Paso 5: When you confirm the detail, haga clic en el Convert button to transcode the 4K Blu-ray video to PS4. Then you can play 4K Blu-ray movies on PS4. Four times as many pixels as 1080p, 4K (4096 x 2160 píxeles) is becoming a well-known resolution now. It produces a sharper and clearer picture and people are more willing to enjoy this vivid video with ease. Under the circumstance, a lot of streaming video sites, including YouTube or Vimeo, start to support online 4K videos watching as well as 4K videos downloading. 4K has truly come into our lives. 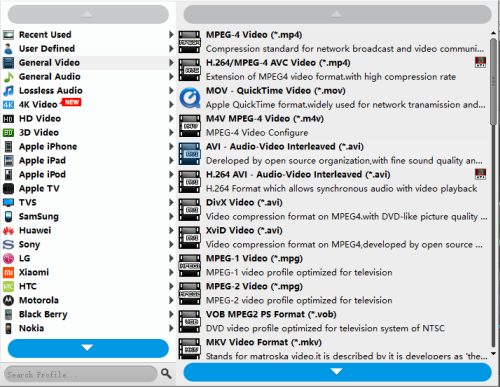 There are many free or paid 4K media player software, such as Media Player Classic, VLC and DivX Player, etc. They can support 4K videos and the playback quality is high to a certain extent. But according to real feedbacks from 4K users, they also experience some troubles when playing 4K videos with 4K player software on computer: the playback is stuttered; the fast-forward and fast-backward scroll bar don’t work properly; the image is fuzzy, etc. Therefore an excellent 4K UHD player is quite necessary for getting a better viewing experience. Compared with other 4K media players, UFUSoft Blu-ray (Mac Blu-ray) seems to be the best. It has been well updated to fix the entire current 4K player software bugs to play 4K videos perfectly and smoothly. Thanks to its professional technology, this 4K player will surely support the incoming 4K Blu-ray movies in the near future. It has both Windows and Mac version to meet all the playback needs. Paso 1: Download and install this 4K video player software on your PC or Mac. Paso 2: Launch this HEVC player and click “Abrir archivo” to your local 4K Video samples to it. Punta: For the incoming 4K Blu-ray movies playing function, you could just click “Open Disc” to add 4K Blu-ray movie disc to this 4K Blu-ray player. Paso 3: Now you can sit down and enjoy your wonderful 4K videos on Windows or Mac. With this software, you can pause/play, fast-forward, fast-backward smoothly and choose subtitle, audio track and take snap shots at will. 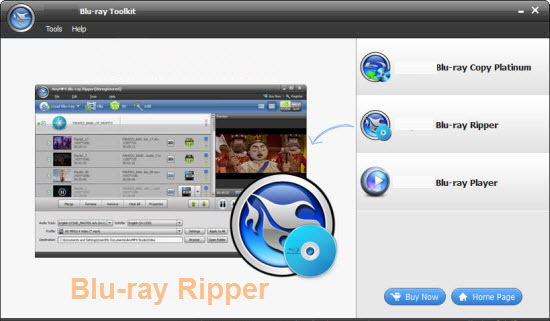 UFUSoft Blu-ray (Mac Blu-ray) is able to play any commercial Blu-ray disc released in any region. Mientras tanto, it supports the newly released 4K or 1080p Blu-ray movies and lets you enjoy lifelike, vivid visuals and crystal-clear details with UHD 4K or full high definition 1080p resolution when playing Blu-ray disc. This Blu-ray Player software also supports UHD 4k or full HD 1080p Blu-ray disc playback. You can build an incredible home theater and enjoy Blu-ray feast with the Blu-ray Player software, a computer and a UHD 4k or full HD home theater projector. If you have made a copy of Blu-ray folder or Blu-ray ISO file on your local disc, you can load it to the program and soon you will be able to watch the movies. The whole process can be finished within a few clicks. Launch the Blu-ray drive to load the 4K Blu-ray disc.Then click the “Open Disc” botón para abrir una ventana de exploración que usted necesita para encontrar la unidad de la virtud en su PC. With this wonderful 4K Blu-ray Player, le permite definir la pista de audio / vídeo, canal de audio, jugando tamaño de la pantalla, etcétera. Después de todos los ajustes anteriores, puede hacer clic en “Jugar” button to enjoy your favorite 4K Blu-ray movies at home with wonderful video quality.